Leopold I (also Luitpold; c. 940 – 10 July 994), known as the Illustrious (German: der Erlauchte), a member of the House of Babenberg, was Margrave of Austria from 976 until his death. He was the first margrave of the Babenberg dynasty which ruled the March and Duchy of Austria until its extinction in 1246. The origins of Leopold the Illustrious are not known. According to some sources, his father Berthold was count in the Nordgau, the region north of Ratisbon (Regensburg) in the Duchy of Bavaria. A more recent theory identifies Leopold as a younger son of Duke Arnulf of Bavaria and brother (or nephew) of Count Berthold of Schweinfurt. While his ancestry remains disputed, some affiliation with the ducal Luitpoldings dynasty is probable. Leopold is first mentioned in a document issued by Emperor Otto I on 13 February 962 as Liupo, count of the Bavarian Donaugau region near Ratisbon, count of the Traungau region, and a faithful follower of the emperor. 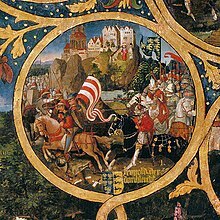 After Otto I had defeated the Magyars in the 955 Battle of Lechfeld, he re-established the Bavarian Marcha orientalis (Eastern March) in the conquered territories, placing them under the command of Margrave Burkhard, a brother-in-law of Duchess Judith, consort of Duke Henry II of Bavaria. When Burkhard joined the uprising of Duke Henry II ("the Wrangler") against Emperor Otto II, he was deposed at the Imperial Diet of Ratisbon in 976. 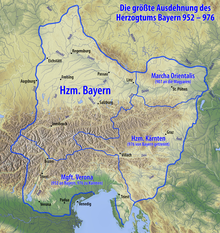 According to a charter dated 21 July 976, loyal Leopold was appointed margrave of the Marcha orientalis, the core territory of the later Archduchy of Austria. The resettlement of the east was a slow process that centered from the fortress of Pöchlarn down the Danube river. Leopold's margraviate originally coincided with the present-day Wachau valley, and whose eastern boundary was the Traisen river near Sankt Pölten east of Krems. With the Magyar threat largely reduced following their defeat in 955, Leopold focused on securing his holdings from internal threats and dissensions. In 984, he engaged in the reduction of the fortress at Melk, which was still controlled by supporters of the late margrave. Once Melk was secured, Leopold most likely used it as his residence, founding a monastery there for twelve secular priests. By 987, Leopold extended the boundary of his margraviate to the east as far as the Wienerwald mountain range and by 991, jointly with reinstated Duke Henry II of Bavaria, further down to the Fischa river . In 994, Leopold travelled to Würzburg to mediate a dispute between his cousin Margrave Henry of Schweinfurt and the Würzburg bishop Bernward von Rothenburg, one of whose knights Henry had seized and blinded. At a tournament held on 8 July, Leopold was hit in the eye by an arrow directed at his cousin. Two days later, on 10 July 994, he died from his injuries. He was buried in Würzburg. In 1015, his son Duke Ernest I of Swabia, was buried next to his father. In the thirteenth century, their remains were returned to Melk Abbey. Leopold ruled over the re-established Marcha orientalis for eighteen years. He organized and expanded it with great ability, and left behind a margravate that had assumed the character of "an ordered and civilized land". The chronicler Thietmar wrote that no man was wiser that he in all his actions, or of a worthier nature. Perhaps the highest testimony to Leopold's life and reputation came from the actions of Emperor Otto III, who immediately invested his son Henry I with his father's margravate. Although Leopold is not mentioned in the Babenberger Chronicle written by his descendant Otto of Freising—which only starts with Leopold's grandson Adalbert—he is known today as the progenitor of the Babenberg dynasty. Otto of Freising's claim of ancestry to the Franconian Babenbergs, who are remembered for the Babenberger insurgency of the early tenth century, has not been proven, but cannot be completely ruled out. In 1976, the millennial anniversary of Leopold's appointment as margrave was celebrated as a "Thousand Years of Austria". Celebrations under the same title were held twenty years later at the anniversary of the famous 996 Ostarrîchi document first mentioning the Old German name of Austria. ^ a b c d e f Lingelbach 1913, p. 89. ^ Wegener 1965, p. 77. ^ Pohl 1995, p. 12. ^ Brooke 1938, p. 52. ^ Leeper 1940, p. 153. ^ a b c d Leeper 1940, p. 158. ^ a b Leeper 1940, p. 159. ^ a b c d Leeper 1940, p. 164. ^ a b c d Lechner 1976, p. 54. ^ Thietmar 2001, pp. 166–167. ^ Thietmar 2001, p. 21. ^ Lechner 1976, p. 45. ^ a b c d Jackman 2008, p. 33. Jackman, Donald C. (2008). Ius hereditarium Encountered III: Ezzo’s Chess Match. Editions Enplage. Thietmar of Merseburg (2001). Ottonian Germany: The Chronicon of Thietmar of Merseburg. Manchester: Manchester University Press. ISBN 978-0719049262. Wikimedia Commons has media related to Leopold I, Margrave of Austria.